(21 April 1989, Kolkata) – Human beings are not isolated beings. Each human being is universal. The longing for physical and psychic pabula comes from Neohumanism, and these longings should be guaranteed by PROUT. Neohumanism is universal humanism. Not a single person should be confined to a particular area. Each and every human being is universal. PROUT is the practical approach. It keeps in view factors such as water, soil, body, mind and mental faculties in combination, in association, and in friendly contact with other developed creatures. PROUT and Neohumanism will free the world from all difficulties. To achieve all this a healthy economy is essential, and for a healthy economy there must be proper planning. Planning should include factors such as population, local conditions, socio-economic potentiality, the sentimental legacy of the people, and the availability of raw materials; otherwise economic progress is not possible. In a healthy economy raw materials should come from the local area. Industries which are based on imported raw materials are always weak industries, sick industries. A sick economy depends upon raw materials from outside – it depends upon inputs. For example, the Barauni Oil Refinery in Bihar is a sick industry because it depends upon crude oil from Assam. If there is any disturbance in Assam or if India is balkanized, then the refinery will have to close down. The establishment of this refinery was a foolish act. It does not represent a healthy economic structure. It is a sick industry, a foolish industry, a stupid industry! The economy of the area and the social life of the people should be balanced. The development of big industries alone should be avoided, because in such industries the local people have no place. As one moves from the north to the south of Bihar, there is increasing surplus labour. In Bihar many types of healthy industries can be established. For example, in northern Bihar healthy industries based on concentrated alcohol derived from sugar beet and sugar cane can be established, and the residual pulp can be used in the paper industry. Fossil fuels are fast diminishing; they should be replaced by concentrated alcohol. Motor cars can run on this fuel. To properly organize and accelerate socio-economic development, Bihar should be divided into five socio-economic units – Mithila, Magadh, Nagpuri, Angadesh and Bhojpuri. Magadh, Nagpuri and Angadesh are the three socio-economic units which are entirely within Bihar. Mithila and Bhojpuri include portions outside Bihar. Let us briefly discuss a few features of each of these units. 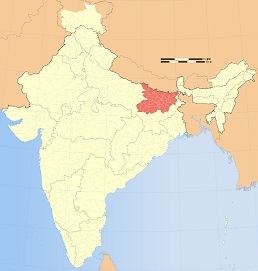 Mithila includes eight districts from India and four districts from Nepal. The boundaries of this socio-economic unit are as follows – in the north the Himalayas, in the south the Ganges, in the east Angadesh, and in the west the Kali-Koshi River. The first Maethilii literature was written 900 years ago by the first poet of Mithila, Jyotiriishvar Thákur, and was called Varńa Ratnákara. In the Mithila area of Bihar, Maethil Brahmins, Káyasthas and Dogamayas speak Maethilii and the rest of the population, including the Bhumihars, speak Angika. The Dogamayas are neither Bhumihars nor Maethils, and they only speak Maethilii. Groups such as the Rajputs, Yadavas, Kurmis, Kuiris, and Káyasthas such as the Amustha Káyasthas and Srivástava Káyasthas, speak Angika. The Maethil Brahmins speak Maethilii at home but Angika outside the home, and the Dogamayas do the same, therefore Maethilii is not the people’s language there. The Paswans and Pasis also speak Angika and not Maethilii. There are two communities of Pasis – the Trisuniya Pasis and the Byadhá Pasis. Those who live in Madhusalai are Trisuniya Pasis and speak Angika. Those who live in Magadh are Byadhá Pasis and speak Magahii. The Trisuniya Pasis have black complexions and they speak in a direct way. The Byadhá Pasis are dark skinned, but not as black as the Trisuniya Pasis. The Brahmins always speak Maethilii in their homes but Angika outside. Where all the castes speak Maethilii, the language of the non-Maethil Brahmins, the non-Maethil Káyasthas and the non-Dogamayas is influenced by Angika. Around Muzzaffarpur there is rich, loose alluvial soil which is extremely good for horticulture, tropical fruits, juicy Mediterranean fruits, and pulses. Nitrogenous soil is not very good for winter paddy, though it is good for growing jute. However, the jute industry does not have a bright future, so it should not be encouraged. Rather, the remi silk industry and the artificial synthetic fibre industry should be developed. Bihar must not try to establish two or three oil refineries because they will be uneconomic. Moreover, although there are deposits of oil under the ground on the Nepal border, no steel industry should be developed because there are not sufficient quantities of red hematite or coal. Nevertheless, many healthy industries based on local raw materials can be developed. For example, high-quality concentrated alcohol fuel can be produced from sugar beet and sugar cane. Concentrated alcohol can replace fossil fuels, as the stock of crude oil is fast diminishing. In addition, the hardened bamboo industry can be developed. If the internal knots in bamboo poles are removed, hardened bamboo pipes which are as strong as steel can be manufactured. The entire Himalayan foothills have abundant bamboo, but no bamboo industry has so far been established in Muzzaffarpur. If this industry is properly developed, it can capture the world market. You should go to the public and explain all these things. About 4,000 years ago Magahii was the most important language in all India. Magahii is 5,000 years old and it has its own speciality which is not found in any other language. The four dialects of Magahii are Aurangabad, Central Magahii of Nalanda, Mungeria and Magaribadh. Magahii is spoken by nearly 30 million people and is the most widely spoken language in Bihar. Patna, Biharsharif and Gaya are big cities which have a population of more than 100,000 people. The entire population of Bihar is about 80 million people. What is the topographical order of Magadh? Where are the different stages of the main rivers? In the rainy season, sufficient water passes through rivers such as the Falgu and Sone. In the plain stage of Mithila there is very soft soil, and this is why the rivers in Mithila always change their courses. No river has its delta stage in Mithila – the hill stages of all are in Nepal, the plain stages in Mithila and the delta stages in Bengal. So to tame the rivers, the cooperation of Bengal and Nepal is required. Unlike in Mithila, in Magadh the hill, plain and delta stages of the rivers are all in Magadh, except for the Suvarnarekha, which flows just on the border line between southern Magadh and northern Chattisgarh. The Koel River must be tamed through the cooperation of Magadh and Kaoshal. Magadh and Kaoshal share many common problems. Although Singhbhum district is in Bihar, it should be included in the socio-economic unit of Bangalistan. It has red laterite soil and the land is full of valleys and hills. The northern portion is located between hills, ranges and valleys, and includes the Suvarnareka, Soiyaya, Khokaia and Keol Valleys. The hills are not very rocky and there is scope for agricultural development. The rivers are seasonal, though they do not dry up completely in the dry season. This region is fit for thermal power, if not hydroelectric power. In the southern part of Singhbhum district there is a copper belt, cheria clay, thorium and uranium. Balbhumi is fertile but Sunderi district is flat. In the northwest as far as Julebiamor and in the extreme east on the northern side of the Suvarnareka River, iron ore, bauxite, manganese and copper can be found. Although there are many rivers in Singhbhum district, there is very little developed irrigation. The soil is laterite. Sixty percent of the indigenous population are Mahatos. The Santals came here 200 years ago from Madhya Pradesh in the Bengali year 1176. There are also Ho-mundas, Singh-mundas and Khangar-mundas. The Singh-mundas came from the eastern portion of Ranchi. The entire area of Ráŕh was part of old Gondwanaland, which included Ranchi, Purulia, western Madhya Pradesh, Burdwan, Bhanjabhum, Surdargarh and some portion of Orissa. This is the place where the first humans were born. It is the first human habitat in the whole world, but people do not know how to develop it. Throughout this area, the per capita income is minimal. Rice comes from Midnapore district. From Dhanbhad to Ranchi, rice comes from Burdwan district. In Lohardaga and the western portion of Chotanagpur, the per capita income is also minimal, while in the Visnupur subdivision it is a bit better. The rivers are still wild, and only the Kangsavati River has been partly tamed. What are the fruits and cash crops that can be grown in Singhbhum district? The soil is good for horticulture. Jackfruit grows well. It can produce alcohol and is also a good cash crop. The nuts of the jackfruit can be ground to make flour which can produce good quality bread. The vege-meat and raw sugar industries can be started, while cashew nuts and masámbi can be grown. Cashew nuts are one of the best cash crops. If bone dust and water is added to the trees, the nuts will be sweet. The area is also good for growing custard-apple, apple and madder, although madder has little commercial value. Sandalwood also grows well, especially in dry laterite soil, but it is not a cash crop because it takes twenty years to mature. Maul can be grown, and from this flour can be made. Pomegranate can also be grown, and if it is fertilized with bone dust it will be sweet. Two crops of paddy and wheat can be grown in a year. On the plains, red skinned potato can be grown, and potato flour, dried potato and potato powder can be produced. White skinned potato is not so good for health. Flower gardens can be grown and the essence can be extracted. Laterite soil is very good for growing roses. Medicinal plants and herbs can be grown also, as well as small grapes. There is no dearth of water in Singhbhum district. Is there any possibility of mangological development in Patna district? What about the mango and papain industries? Papain is good for the stomach. It is especially good for dysentery and other stomach diseases. Mango and guava are two horticultural items that can be grown here. What types of mangoes should be cultured? Where and how can they be grown? What sort of fertilizers do they need? You should know the answers to all these questions. In Magadh the Ganges flows from west to east. On one side of the Ganges is Magadh and on the other side is Mithila. The soil beside the Ganges is riverine alluvial and is good for growing mango, lychee, banana and lemon. Some portions to the south of the Ganges in Patna – which in Sanskrit is Pataliputra and in Hindi Patna – and some portions to the north of the Ganges also contain soft alluvial soil. In the southern part of the Ganges for ten miles towards Patna, the soil is fit for mangoes. Digha is within a ten mile radius of the Ganges, as is Maner. Beyond ten miles, there is clay soil which is not fit for mangoes. Further out the soil becomes laterite and Gaya mangoes can be grown. The land around Mokama is not fit for mangoes as the soil is hard. In Begusarai soft alluvial soil is found, so mangoes can be grown. In Magadh – in Gaya and Navada for example – there are no mangoes, and if they are grown, they will be sour and contain worms. Thus, the soil is alluvial towards the south up to ten miles from the Ganges, then it is clay after ten miles, beyond that it is hard and laterite, and towards Gondwanaland it is laterite. North of Patna is suitable for lychee, mango and lemon, but not suitable for papain fruits such as papaya or guava. While guava can be grown, the large type such as that found in Allahabad cannot be grown. In the southern part of the Ganges, papaya grows better than in the north and the papain industry can be developed. The papayas will be small but sweet. Mangoes will also grow well there. In the Ganges Basin mango and lychee can be grown. The Malda and Murshidabad districts of Bengal are also very good for mango cultivation. For agriculture, we must consider factors such as the soil condition, soil blending, climate, water supply and the types of land. For example, there are several types of land according to how the soil holds water. First, high and dry land is barren land and retains little or no water in the soil. If water and fertilizers are added to the land, it can be made productive, and some fruit crops, beans (kurti) and lemon grass for the cosmetic industry can be grown. The land at Ánanda Nagar is high, dry land. Secondly, barren plain land will hold water if it is properly tamed. It should be transformed into farming land – into horticultural and agricultural fields – and for this irrigation is essential. Thirdly, average land will hold water longer than barren plain land. Fourthly, moist fertile land is suitable for most types of farming and retains water well. The best land is moist fertile land, followed by average land, then barren plain land, while high dry land is the worst. Farmers do not know how to fully utilize the various types of land and soil. In Bhanjabhum, Surdargarh, Singhbhum, Keonjhar, Jhargram, Purulia, East Ranchi, Vyaghrabhum and Dhanbhad there is hard laterite soil which is ideal for horticulture, provided the soil is properly manured. Dumka has different soil from the rest of Ráŕh as it is less laterite. After proper manuring, mangoes can be grown in Deoghar district. In Patna district, especially the northern portion, castor can be grown. Paddy grows better in plain land, whereas wheat grows better in dry land. The word “wheat” comes from white. Wheat means “whiteness”. Rivers will cut paths right through waterlogged soil, but it is more difficult for them to cut through barren plain land or hard laterite soil of the clay type. So while constructing a bridge, both sides of the bridge should be built on foundations of hard soil. While constructing the Rajendra Bridge over the Ganges at Mokama, the soil towards Mokama is plain land, but towards Barauni the land is waterlogged, which means that the bridge can be easily washed away. If farmers adopt the cooperative system they will enjoy many benefits. For example, the land wasted in constructing boundaries around individual plots will be utilized, significantly increasing the area of farming land. Land of the same level should be consolidated into one area for cooperative farming, but if the land is wavy, the area of the consolidated land should be smaller. In wavy land and land which contains small river valleys, small-scale inexpensive irrigation projects which cost only one to two hundred thousand rupees should be started. Such amounts can easily be arranged through cooperative effort. In addition, mixed farming and crop rotation can also be done through cooperatives. At Anandanagar there can be four crops in a year. I have already said which fertilizers and manure are best for what types of land. The fertilizer used for farming should depend on the type of soil. Sericulture can be developed on barren land according to the climatic conditions. In Bihar, endy and muungá silk can grow well, but not mulberry silk. Endy silk is golden and muungá silk is reddish. Standard Nagpurii is the language spoken in Gumla. In Ranchi the language is influenced by Bengali and Magahii. Magahii, Maethilii, Bhojpurii and Nagpurii are not recognized by the government of India. Maethilii is recognized by Calcutta University. Angika is not even recognized by the Sahitya Academy, the government of Bihar or the government of India. What are the soil problems and rock conditions of Palamu district? What are the main rivers? Palamu district starts in the northwest corner of Chotanagpur and is a small place. In the Sone River Basin in the west of Palamu district, the Sone River flows from southwest to northeast, while in the east of Palamu district it flows from northwest to southeast. In the heart of the district is the Koel River. Palamu was once the central portion of Gondwanaland and the rock is sedimentary. The Damodar Valley is located in the eastern portion and the central west of Palamu district. Along the Damodar Valley there are coal deposits. In the western portion of the river valley there are also coal deposits, old hard rock, metamorphosed rock, tungsten, hard metals, iron ore and red hematite. This is a Magahii speaking area. Latehar subdivision and Garhwa are also Magahii speaking areas. The other side of the Sone River in Madhya Pradesh is also Magahii speaking. The red soil is laterite soil. The history and annals of Palamu are unique. It is the old habitat and abode of the Oraon tribe who speak the Kuruk language, a tongue of Dravidian origin, and a sister language of Tamil, Telugu and Malayalam. There used to be Rajput kings in this area, but after they were overthrown, blood relationships with outsiders began. Palamu was independent up to the Pathan period. In the Mughal period Palamu became part of the Mughal empire and paid tribute to the Nawab of Bengal, but practically it remained independent. Gaw in Malda district was the capital of Bengal in the Mughal period, and later it became part of British Bengal. In the British period, the headquarters was changed to Hazaribagh. In Hazaribagh district most people speak Magahii; the biggest river is the Damodar. The extreme south and central is the industrial belt which has great industrial potential. There is also a mica belt, and the major portion of it is Koderma, which is now separated from Hazaribagh and included in the newly formed district of Giridih. Coal can be found in the Damodar Valley. How did Hazaribagh get its name? Hazaribagh was named after Harailal Singh Deo of the Ratu clan, who owned a large estate. He died in a clash with Shish Nath, the last of the Chotanagpur kings. In Hazaribagh district subterranean minerals, forestry and agriculture can be developed. The soil is fertile. What are the problems of Nagpuri and the lower Lohardaga district? How are you to solve the irrigation problem of lower Lohardaga district? Where shall you get the water from? Some water is available near Netarhat, where good laterite soil is also available, but this area suffers from lack of water due to deforestation. Magadh also suffers from deforestation. So for development schemes, large-scale afforestation everywhere is most essential. Lohardaga district has mixed soil. It is a very small district carved out of Ranchi. The main tribe there is the Oraon tribe who speak Kuruk among themselves and Nagpurii or Sadari with others. Kuruk is of the Tanabhagat group. The Mundas speak Sadari. Bauxite can be found there, and an aluminium factory should be established. Hardly any industry has been established from the locally available raw materials. The land currently produces only one crop of paddy a year, hence the people live in extreme poverty. Sixty-five percent of the population are tribals and thirty-five percent are non-tribals. The non-tribals are blacksmiths and traders. Angadesh is more downtrodden than the Kaoshal region of Orissa. There is no industry in Angadesh, and even the people’s language, Angika, is not recognized. The people’s language should not be suppressed. If your mother tongue is not recognized, nobody will recognize you. None of the mother tongues of Bihar are recognized in the Indian constitution, and that is why a Bihari has to live like a second-class citizen while many other minor languages are recognized. The government of India, the National Sahitya Academy, the Sangit Academy and the Bihar government have not recognized the Angika language. In fact, not a single mother tongue in Bihar has been recognized either by the government of India or the government of Bihar. This reflects badly on the government leaders. Primary school education should be in the people’s language, and primary school books in Angika should be introduced. In Angadesh the indigenous population is being exploited by outsiders. The Angiks are poor and destitute, and most of them depend on agriculture for their livelihood. Their lot can only be improved when some progressive farming methods are adopted. For example, those parts of Purnia, Katihar, Madhepura and northern Bhagalpur which extend up to six miles from the southern bank of the Ganges River should grow cash crops successfully. An integrated system for growing certain cash crops is outlined below. Kerala hybrid variety of coconuts: Before planting each sapling a hole three feet deep should be dug, and five kilos of salt should be put into the bottom of the hole. The salt should be covered with a layer of sand, then the sapling should be planted erect, and the roots compacted with more sand to fill the hole. A pyramid of sand should be made above the level of the soil around the base of the sapling. Leaf mould should be placed at the top of the pyramid. This will be gradually absorbed into the soil. In the event of a shortage of rainfall, the saplings should be irrigated by a sprinkler system which will resemble rain for the plants, thus enabling them to grow in a natural way. Black pepper farming: If black peppers are planted beside coconut trees, no further land will be required as the black peppers will climb the trees. Black peppers do not need any fertilizers other than leaf mould and cow dung manure. Areca nut cultivation of the Coochbehar variety: This can be cultivated very successfully on the same land as the above crops. Cow dung manure should be administered once a year before the rainy season starts. All the old dead leaves of the areca nut plants should be removed and the plant should be cleaned in September and October. Pineapples: A good harvest of pineapples can be gained in those fields of Purnia, Katihar and Madhepura districts, where the rainfall is more than six inches. In salty soil also there can be good harvests. In Purnia, the Siliguri variety will produce a good harvest, and in Katihar and Madhepura, the Baruipur (Calcutta) variety is suitable. Red pepper and green chilli: Red peppers and green chillies of the Kalna (Burdwan) variety will yield good harvests as second grade seasonal cash crops if they are grown in the northern and southern portions of Angadesh respectively. Green chilli of the sowa variety will grow better in southern Angadesh. The manure used should be mustard cakes, custard cakes and baranj cakes – that is, the residue of these seeds after the oil has been extracted. Mangoes: Malda district to the north of Angadesh will grow good crops of fajali, langara, ásina, svajpuri, lakśmanbhag, etc. – in fact, all varieties of mangoes. Where there is a scarcity of land, these varieties can be grown in large earthen pots. The manure should be a mixture of twenty-five percent cow dung compost, twenty-five percent leaf mould compost, twenty-five percent bone fertilizer and twenty-five percent crushed bricks. Dead lime can replace bone fertilizer. Some other crops: In southern Angadesh, grapes will be very good seasonal crops. Jackfruit of the Bankura variety and jám of the red Jammu variety also grow very well. In the hilly land of southern Angadesh, the following can be produced – cloth, carpets and mats from the fibres of the sisal variety of bamboo (ram bamboo); silk from custard plants; and mulberry and mulberry silkworms. In addition, in southern Angadesh papaya can be grown, and from this papain can be produced. Rice bran oil and cement can also be manufactured from rice husks. In northern Angadesh, jute cultivation can be used to produce match sticks, and paper can be produced from the residue of sugar cane, and also from maize or corn cobs. In the red soil of Angadesh, the Hyderabad variety of grapes, the Bankura or Ánanda Nagar variety of papaya, cashew nuts and jackfruits of the Bankura variety, jám of the red Jammu variety, mangoes of the Ráŕhi Bombay and Ráŕhi Madhukalkali varieties will grow very well. There is a tri-portion of land, which includes parts of Nepal, Bihar and Bengal, where Bhojpurii, Angika, Maethilii and Bengali are spoken. The Angika speaking part of this tri-portion was conquered by Prithvi Naryan Saha of Nepal in the first phase of the British Raj in the battle of Plassey in 1757. The Angika speaking population of Nepal live in Morang district, which has a provincial city at Viratnagar. The Angika speaking portion of Nepal should be included in Angadesh. This is a geo-economic necessity. There should also be a train from Bhagalpur to the Himalayas. The indigenous people of Nepal include the Sherpa, Bhutia, Newari and Lepcha. What about underground wealth in Angadesh? In the western portion of Godda district there is limestone, dolomite, China clay and coal. In the eastern portion there is no dolomite, only coal. Red hematite and iron ore can also be found around Jamalpur, but not on a large scale. Recently gold deposits were discovered in the Sonu block of Jamui district, and there are coal deposits in Lalmotia. The cheapest electricity in Angadesh is thermal electricity from coal. There is no need to purchase coal from outside as is being done now. Solar power can also be generated in the plain areas where the land is wavy. Northern Angadesh suffers from lack of proper irrigation and drainage, and from waterlogging. Southern Angadesh suffers from lack of proper irrigation. The land is to be systematized for proper water management. For example, as there is a scarcity of water in the south, the surplus water form northern Angadesh should be drained and shifted to southern Angadesh. If oil from Assam can travel all the way to Bihar by pipe, why not water from northern Angadesh to southern Angadesh? The Kosi belt in the north – that is, the land around the Kosi river – remains submerged due to waterlogging. The entire Kosi belt is a waterlogged area. The sediments carried by this river have a bad effect on the fertility of the soil, hence the water should not be used for irrigation in the rainy season. Drainage does not mean the wastage of water. If the water from the Kosi River goes into the Ganges and the Bay of Bengal, it will be wasted. There is immense agricultural potentiality in Angadesh, and many more agro-industries and agrico-industries can be developed. You should get three crops in a season from the land, but now there is only one crop. In southern Banka there is only one crop of paddy and no other crop in a year. Recently a new district was created called “Chandan Kotaria” at the meeting point of Magadh, Angadesh and Bengal. It was formed out of Jamui, Deoghar and a little bit of Banka. This district is very dry but has very fertile land which is ideal for agriculture. The main industries in Angadesh are agro-industries and agrico-industries. In the extreme southern portion limestone can be found. Limestone and China clay are also available in western Godda, so a cement factory may be started there. From rice bran and limestone, cement can be made – these are two of the main raw materials for cement. Dinajpur was the main centre of the Kaevartas 2,000 years ago. From there they migrated to many places, including Purnia, but they still speak Bengali in their homes. Their complexions are not very dark – more an earthen colour. They have round faces, are not tall and work mostly in agriculture. Previously they were the main community of Purnia, which is just to the west of Dinajpur. They follow all the Bengali customs, such as the Bengali system of marriage. In Purnia District, there are four Bengali speaking communities – the Káyasthas, the Haris, the Doms, who generally burn dead bodies for a living, and the upper caste Sadgopes, who are milkmen. (The Haris and Doms are Scheduled Castes). These four groups generally speak either Bengali or a mixture of Bengali and Angika in the home. Though some of the Kaevartas have the surname “Mandal”, most have the title “Vishvas”. Besides the Sadgopes, there are many other groups in the Gope community who have migrated from Bengal and who still follow Bengali customs. Their language is now the local language, and they are called the “Corygopes” or the “Corywallahs”. Some of the Gope community migrated to Bihar from Murshidabad, and Burdwan and Birbhum in Ráŕh, to check the spread of the Muslims, because they were experts in stick fighting. This group is called the “Ghosis” and their surname is “Ghosh”. I want a detailed scheme – an ideal scheme or blue print – for Angadesh, Magadh, Nagpuri and Kaoshal from north to south. Angadesh is almost plain, except the southern portion. The other three socio-economic units are mixed. Magadh is plain and wavy land, while Nagpuri and Kaoshal are wavy and valley land. Utilize each and every inch of land. Utilize each and every drop of water. Exploitation exists in every sphere of life – the social, economic, cultural and psychic. Exploiters do not care whether an area is a surplus labour or deficit labour area. Bhojpuri is a surplus labour area, while parts of Bengal and Assam are deficit labour areas. All of these areas are exploited. Angadesh and Assam are the worst affected areas. In Angadesh, Bhagalpur and Monghyr are the only cities, and in these two cities outside exploiters dominate. They have no sympathy for the local people, their language or their sentimental legacy. Ranchi is also controlled by outside exploiters, while in Orissa land and assets are in the hands of outsiders. In India elections are very costly. Money for elections comes from both local capitalists and foreign agencies. Bhojpuri covers several districts including Gorakhpur and the entire Bhojpur area except Bastar district. There are three scripts in Bhojpuri. The first is Nagari script, which is used to the west of Allahabad. Max Mueller wrote the Vedas in Nagari script, which was named “Devanagari” 800 years ago. The second is Sháradá script which is used to the northwest of Allahabad and is 1,300 years old. The third is Kut́ila script which is used to the east of Allahabad. It is the script for Oriya, Bengali, Bhojpurii, Maethilii and Angika and is 1,100 years old. The mother tongue of Krśńa was Shaurseni Prákrta. Later on Braja emerged from Shaurseni Prákrta, and is spoken to the west of Allahabad. The Muslim poet Raskhan, and Rahim and Surdas, were the poets of Prákrta. The Agrawals of Braja belong to the Braja area and are not Marawaris. The Muslims of Allahabad speak Avadhi, although the Shias speak Urdu. The three large cities of the Bhojpuri area – Varanasi, Gorakhpur and Chapra – have no industries. All the assets are in the hands of outside exploiters. Let there be a fight against outside exploitation. Let the people understand the meaning of polarization! What are the agricultural possibilities of Gorakhpur and Deoria districts in Uttar Pradesh? Are they the same? Deoria is more riverine than Gorakhpur, so more jute can be grown in Deoria than in Gorakhpur. If wool is mixed with jute, good quality jute’s-wool can be prepared. Good jute can be grown near Nepal. Transportation and marketing should be kept in mind when developing all agro-industries. For example, if horticulture is developed in the ten mile radius around a big city such as Gorakhpur, it will be more economically beneficial for the farmers than if the orchards are located further away. You should know your country and the entire globe. Know all their secrets. The fight to restore one’s mother language is a fight for dignity. Each mother language should be spoken and developed. While working for the welfare and development of your country, also spend some time for the development of your mother language. i want to know about Nepal , its history ,about madhesh, and socio economic division of Neal in prout. There is no chance for the welfare of the world unless the condition of women is improved. It is not possible for a bird to fly with one wing.